I'm (sort of) gettin' too old for this ish (or these issues, to be exact). 1. So is everyone else. 2. I kind of don't care. Don't get me wrong , there are titles I'm curious about. 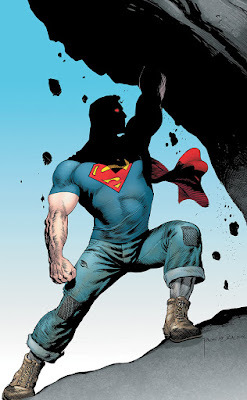 More Grant Morrison Superman? Sure. Jeff Lemire's takes on both Animal Man and Frankenstein have me intrigued. I loved what Brian Azzarello and Cliff Chiang did on the Dr. Thirteen: Architecture & Mortality series in the Tales of the Unexpected revival, so I want to see what they do with Wonder Woman. All-Star Western might be decent if there's plenty of Bat Lash, and if Jimmy Palmiotti and Justin Gray don't turn it into Rip Roarin' Rapin' Western Comics they way they did their first run on Jonah Hex (which drove me away completely). Paul Cornell's book with the Demon doesn't interest me, but his take on Stormwatch does. And... well, you get the point. Clearly there's stuff here that piques my curiosity, and I'm sure I'll buy some of the first issues come September, especially if DCBS makes with the sweet discountage. But I can't help but feel that this makes a better jumping off point for me than a jumping on one. I'm not saying I'd abandon comics altogether. That'd be crazy talk. It might be easier to get me to go off food than comics. Nor am I abandoning "mainstream" comics (whatever that means anymore), nor even DC books in particular. I think I'm just looking for a change in focus. This may finally be my chance to go trades only on the Big 2. Or maybe I'll just play exclusively in the back catalog. I don't know yet. I do know, though, that a lot of this new effort feels Not For Me. And that's by design. DC has stated as much. A lot of us old timers (and I've been reading comics for at least 31 years now, so I think I count as such) are focusing on the new/relaunched series, but I think DC's main focus is actually the whole "day & date" digital release thing, which, yeah, may appeal to those of us who have devices that make reading digital comics easy and pleasurable. I do not; I have an iPod Touch, not a tablet of any kind, and while I certain can read comics on it, I don't really enjoy it. But really, DC isn't after us, they're chasing after a new, younger (or younger skewing, at least) demographic, hoping the digital thing catches their fancy (since they absorb so much content digitally anyway) and draws them into comics. We're allowed to play along, if we like, but really, it's Not For Us. And that's okay. Hey, everyone who reads comics wants to more people to read comics. If this makes that happen, then bravo. I hope the next batch of folks gets as much joy out of these characters as I did. And probably will continue to do so, even if it's not in the same format, or even the same content. Hey, I've got a Showcase Presents Metamorpho book over here I've been just dying to dig into... I'm happy as can be. As long as they keep the past accessible, they can do whatever they like with the new stuff. And if I happen to like some of that, too, all the better. I just want some funnybooks I can enjoy, and I won't begrudge the new folks theirs. Major props to Marvel for this.